One quick thing before I get into talking about the new dress: I’ve signed up with Patreon, a service that helps people become patrons of the art and media they like. If you would like to support me and my work, please take a look at it! The style of the dress makes it seem like a very foresty, homey type of gown. 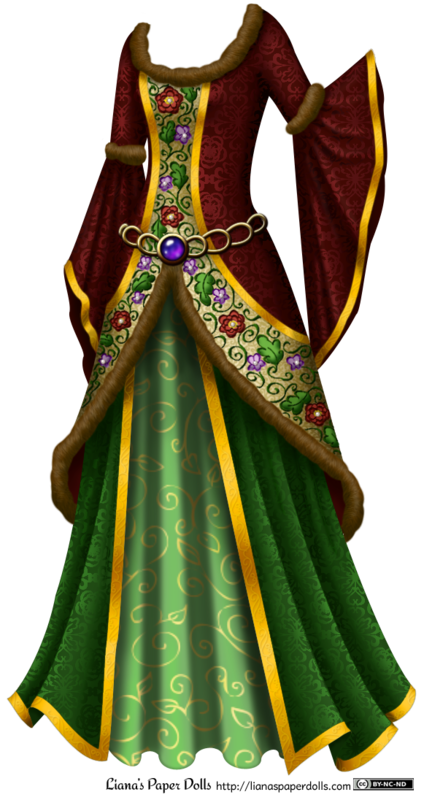 I think I’d like to see the overcoat in earthy tones of red with gold accents, maybe with a brownish-gray fur trim, and the underskirts in shades of green. I’m not sure if I exactly hit “homey” and “foresty” notes with all of the embroidery, satin and gold trim, but the results are lovely, so maybe it’s something Maid Marian could wear when she needs to get dressed up. Hannah, I hope you like how it turned out! I really enjoy trying to fulfill someone else’s color scheme, because I feel like I always learn something I wouldn’t have when I color it by myself. I posted a series of pictures showing the steps in making this dress on my Tumblr, if anyone is interested in that. My intention is to hold these contests once a month and spread them among my various social media venues, the blog and the mailing list. I haven’t decided where the next one will show up, but it will start on the 13th. Next time there will be a special Valentine’s Day present for all of my beloved readers, so come back next Friday! Don’t forget to follow me on Facebook for updates and fun things, Twitter for my thoughts and sneak previews, or Pinterest for lovely dresses and jewelry. You can also sign up for my mailing list at the top of this page! Your work with digital coloring is amazing! Now this question is out of plain curiosity; have you ever done a boy paper doll? I wasn’t able to look into your archive due to a computer glitch. Thank you! I did a boy paper doll many years ago, but (even though his face was modeled after my husband, my boyfriend at the time) I don’t think he turned out very well, and I’m not much on men’s clothes, so I never did another one. Thank you! :) I feel like I’m just getting started, but I am pretty proud of this one! I am so thankful for you! I have all of your dolls except Mia, I am thinking of printing her for my cousin. I am ten years old, and I just LOVE all your dolls and all their pretty dresses! Thank you! I’m glad I created something you love :) I hope you print out Mia for your cousin and she enjoys her and the new dresses! Wow! You’ve updated the website AND created 2 dresses that make me want to have them sewn up and wear them! I adore the poet sleeves! !